Incredible 50 metre high steel trees! Truly one of the worlds most incredible creations! The giant steel trees with their tangled trunks covered in an intricate web of living vertical gardens are only one of many amazing architectural and horticultural sights that will truly blow you away in Singapore’s Gardens by the Bay project. There are so many things within this site that really get the superlatives flowing! Where and how do you start describing this truly amazing development? Is it the eighteen uniquely designed and vertically planted “Super Trees” which tower beyond the fifty metres mark (or sixteen storeys), that welcome visitors on arrival or is it the ethereal resonance of the incredible architectural forms that make up the massive Flower Dome and Cloud Forest greenhouses? Whatever it is, it’s an amazing experience that leaves the visitor with lasting memories, and perhaps like me, just a little frustrated as the realization dawns that I have certainly not budgeted enough time to experience more than just a glimpse during my brief visit to Singapore. Originally the Gardens by the Bay project started as a design competition with a public exhibition of the winning designs and models held in 2006, with over 10,000 people visiting the exhibit and providing their own opinions and feedback. Two English landscape architecture firms won the contracts for their designs, with Grant Associates http://www.grant-associates.uk.com/ design, forming the basis of the main Gardens by the Bay development, and Gustafson Porter http://www.gustafson-porter.com/ for the Bay East project. This still developing area, together with the main Gardens by the Bay site, make up two of three distinct waterfront precincts designed to make Singapore truly a number one garden city. The Gardens by the Bay is not only a showcase for amazing architecture and design, it’s also been created to show off some of the world’s most incredible and diverse flora. Its amazing biomes offer a diverse array of differing plants from all around the world reflecting diversity from semi-arid and cool temperate to montane and cloud forest, while incorporating some of the worlds most advanced environmentally sustainable engineering practices to keep them alive. Most of this hidden infrastructure is cleverly built into the plantings so that it keeps a high practical functionality but also avoids clashing with the aesthetics of the gardens. These include photovoltaic cells at the tops of the giant trees generating power for the site, while others in the glasshouses are incorporated into the living tree plantings and additionally serve as hot air exhaust vents. 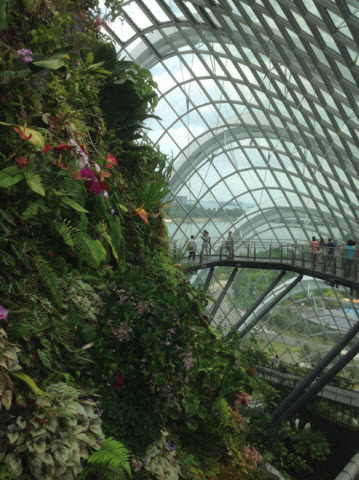 The site is powered through a massive steam generation system that uses the horticultural wastes obtained from the site and other parks and gardens throughout Singapore. Excess heat from this process is also used to assist in drying the dehumidifying agents that are used to reduce humidity in the Flower Dome. Dehumidifying the air not only assists the specialty plants growing in this dome but it actually means that less energy is required to cool the structures. 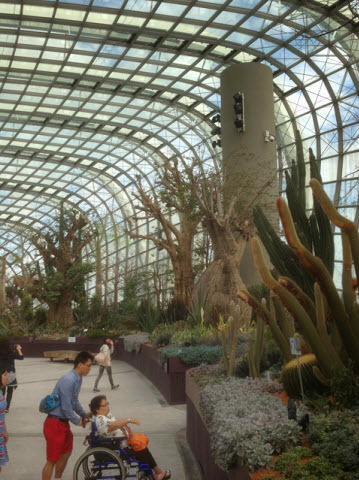 Without this, the Singaporean climate would be a killer for many of the plants growing luxuriantly within the massive domes. Additional automated shading sails on the roof and an extensive underground thermal stratification system keep the greenhouses at temperatures suitable for the species collections in each of the areas. Half way up the mountain and the suspended walkway. 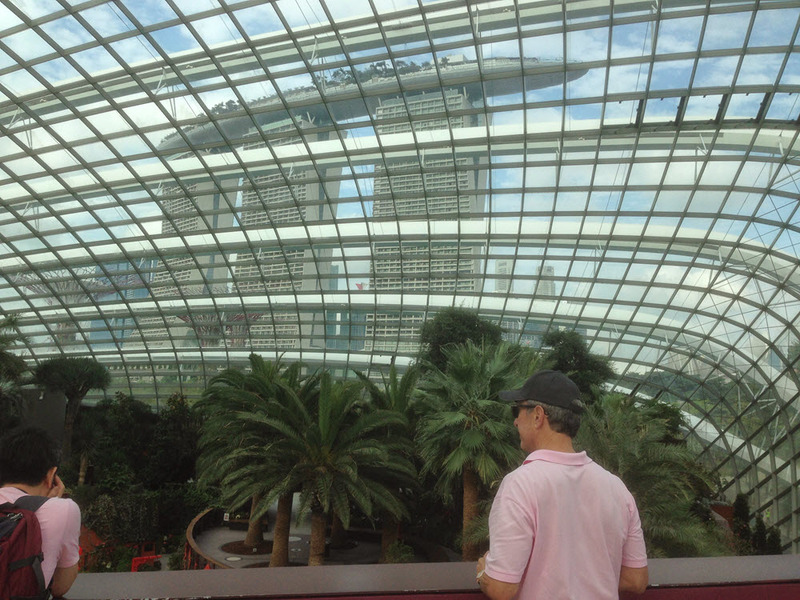 I had the pleasure of a personal tour of the domes with Michelle Chan the Assistant Director of Education and Outreach at Gardens by the Bay. She was incredibly generous with her time and very patient with the many questions that I just had to ask as we wandered through the Flower Dome and the Cloud Forest Domes. The domes themselves, essentially giant greenhouses on steroids, are spread over enormous areas and provide visitor access to the plantings on many layers up to a height, in the Cloud Forest, of around 35 metres. At this height the representative plant collections are typical of plants found growing in montane, cloud forest conditions similar to those in the wild at heights between 1000 to 3500 metres. 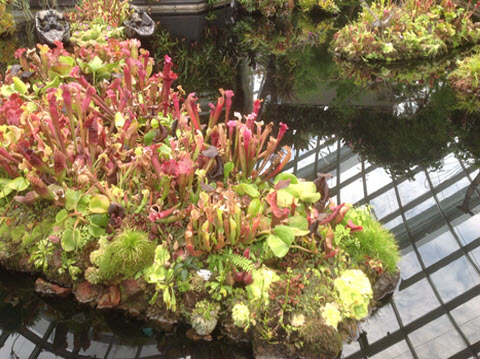 These plants included an incredible array of carnivorous plants growing on small sphagnum moss islands pleasantly situated in shallow black bottomed pools that reflected their features like high definition mirrors. To top it all off, when the periodic fogger jets came on, it was not hard to imagine yourself on a collecting trip on a foreign peak in the deepest highlands of South America, except of course being periodically interrupted by all the other people that were up there trying to imagine the same thing! Other plants spotted on this peak included many species of epiphytic orchid, plants of the Bromeliaceous kind, mosses, various ferns and their relatives. 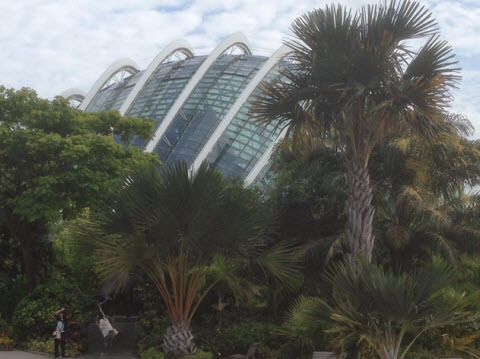 The plantings on the floor of the Cloud Forest dome included some Australasian representatives including young examples of Agathis robusta (Queensland Kauri Pine) and Araucaria araucana (Monkey Puzzle), plus A. bidwillii (Bunya Pine). These trees will need ample space to grow to their full potential and they will surely get that in the Cloud Forest with a floor to peak height of 55 metres. 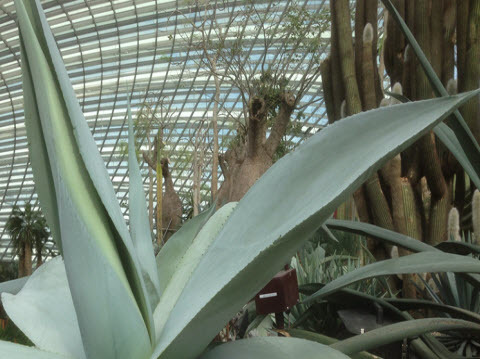 The total floor area in the Cloud Forest Dome is just short of 2 acres (0.8 hectare), and is smaller than the Flower Domes slightly larger footprint of nearly 3 acres or 1.2 hectares. A special and striking display was featured around the central section of the Cloud Forest mount which included a large garden made entirely from Lego blocks shaped into giant carnivorous plants. These Lego plants were strategically placed to feature in amongst the real carnivorous plants that they were modelled on; a captivating display that mesmerized more than just the little children! The Flower Dome was an incredibly striking structure that has the current ‘honour’ of being listed as the largest glass greenhouse construction in the world. It is also the largest column- less greenhouse in the world with more than 3332 glass panels of 42 different shapes and sizes, a truly incredible design and an engineering marvel. It is inspired in its structure and form from natures own design, from the natural shape and strength of an eggshell. It houses a carefully controlled range of environments, suitable to display and interpret a vast collection of plants suited to cool-dry Mediterranean climate types. Plants from the Mediterranean basin, Australia, South Africa, Central Chile and California are all represented as well as a host of general ornamental plants mostly at the entrance and around the function areas. It was interesting to see flowering, cool temperate bulbs such as Narcissus (Daffodils and Jonquils), well out of season in the southern hemisphere, yet in full flower in various locations (probably brought in from Europe and forced into bloom for short term colour). It was probable that these displays were temporary as it was a celebratory time, being the start of the Chinese New Year and a time for flowers and fruits of all kinds. One of the famous areas of the Flower Dome was the Olive Grove, an area made up of around 12 very mature Olive trees, some of which are more than 1000 years old. 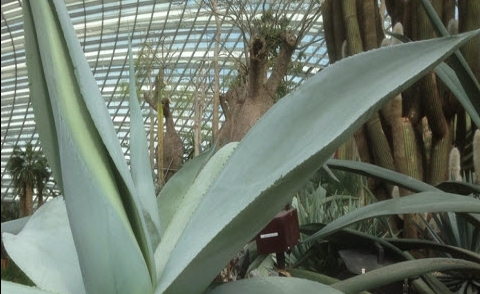 Brought from Spain and transplanted as full specimens in 2011, they have established very well and have been thriving within the climate of the dome. Using special fans stealthily installed under the trees, the horticultural teams have experimented successfully with artificial pollination around flowering time. This has ensured that the wind pollinated Olives achieve successful pollination and since this has been established the trees have regularly produced yearly crops. I was told that the original team that went in search of the Olive trees in Spain spent many a day searching various orchards for suitable trees before coming across one farmer who opened his orchard to them, and he told them to take their pick from the many hundreds he had on site. A veritable Olive ‘gold mine’ no doubt! 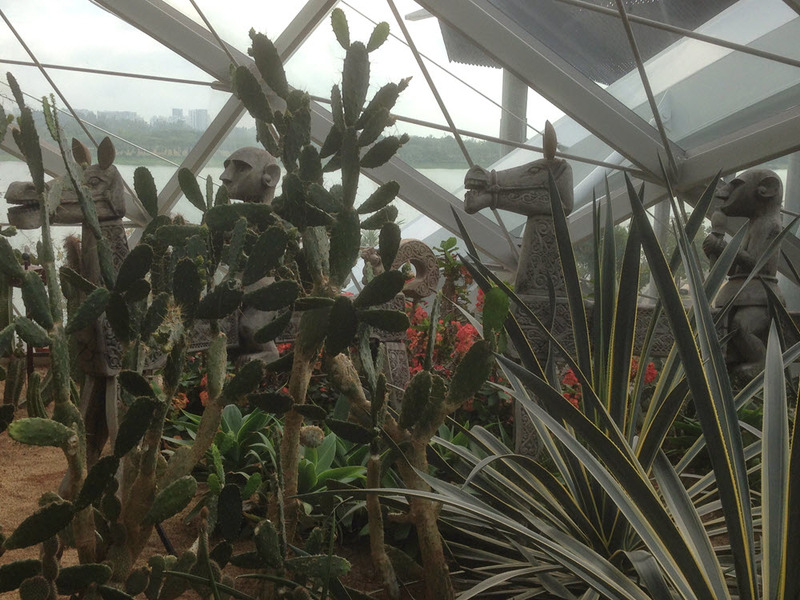 Another significant feature in the Flower Dome is the amazing Baobab and Bottle Tree gardens. 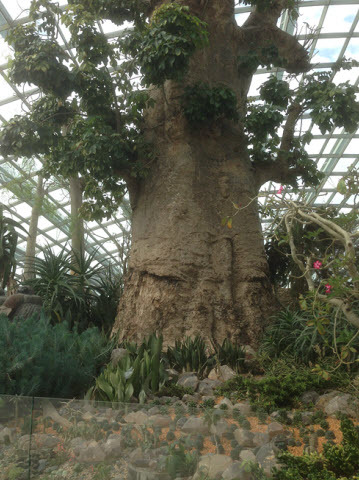 Here mature Boababs, Adansonia digitata dominate, with one of them weighing in at more than 30 tons and by far the largest tree in the Dome. The trees and various understory plants in this garden are planted in raised garden areas, that is itself a main focal point towards the top of the planting space within the Dome. Interpretation details provided in this area tell of the trees immense importance to its natural African environment and the many practical uses of the tree by the local human communities. There are many intriguing stories from this one tree alone, such as the bats that pollinate the flowers through to the elephants that help its seeds disperse and germinate into the environment. This dramatic display is the epitome of the incredible diversity of plant collections displayed within the Dome and one that leaves a lasting impression on the visitor. From time to time as I took a breath and paused to take in the surrounds of the Dome, I could not help but stand in awe at the amazing architecture both of the Dome’s cathedral like forms and from the truly futuristic, and almost out of this world architecture that seems to project in through the glass of the Dome from the city surrounds. Breathtaking to say the least! 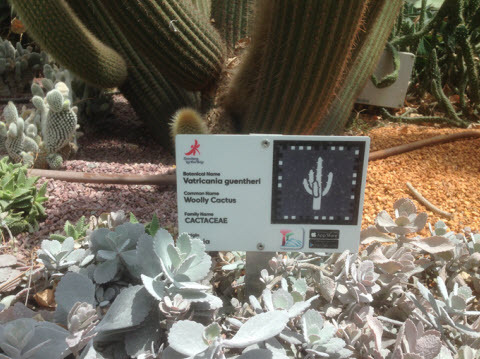 Technology has been incorporated within the Gardens visitor interpretation experience including a specially designed mobile application that allows the visitor to interact with various strategically placed signage. This app allows the visitor to access other interpretation resources, activities and information on their mobile device which can then be used onsite or saved for future use. Unlike other technologies such as QR codes which are often used for this type of experience, this is custom made and the graphics are therefore more attractively presented on the signs than a barcode. As you wander between the Domes a walkway takes the visitor through a high tech zone of floor to ceiling displays many of which are touch screen activated allowing visitors to interact with the specially developed resources that aim to sensitively and almost subliminally highlight the environment, its vulnerability and its relationship with the future sustainability of humanity in the natural environment. 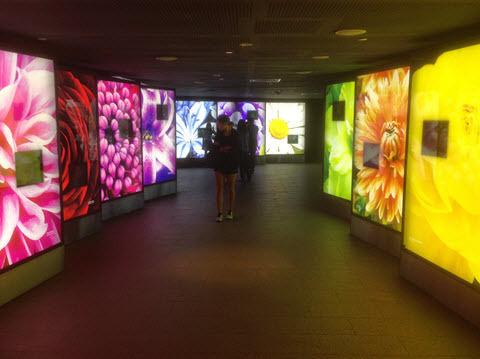 These technology displays culminate in a large floor and ceiling cinema where expansive views of natural systems are projected on one of the broad walls and even underneath the visitor as they walk through. This is as truly immersive an experience you can get without getting into the more complex 3D technologies. 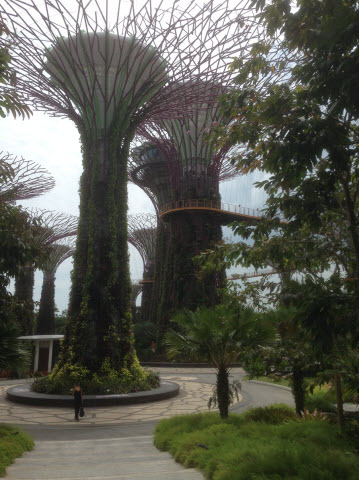 My experience was just too short to do this incredible place justice, the Gardens by the Bay project deserves its non official title of a ‘Wonder of the World’, and if you ever do visit Singapore it is a must see destination. 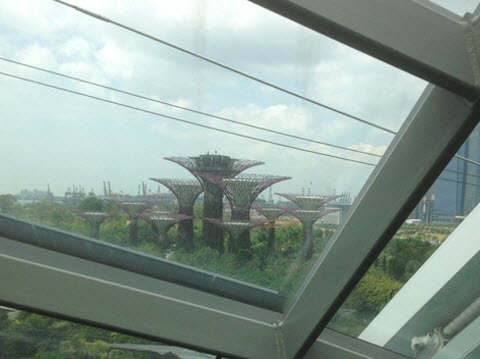 For me this will not be my last visit to the Gardens by the Bay and for the next time one day is just not long enough! Personal Information Protection | Tasmania Online | Service Tasmania This page was produced by the Royal Tasmanian Botanical Gardens, a business unit of the Department of Primary Industries, Parks, Water and Environment. Use of this website is subject to our disclaimer and copyright notice.